Although I am not a huge fan of the heat in the summertime, there are a few things that I absolutely love about the season: bbq cookouts, the long days, all the fresh fruit at the farmer’s market & ice cold desserts. It is basically these 4 things that get me through the dog days of summer – with the exception of my air conditioner... which I am proud to say has not yet been turned on this year! I have been thinking of a dessert I can make this year for our cookouts – a twist on a classic that also contains real fruit. 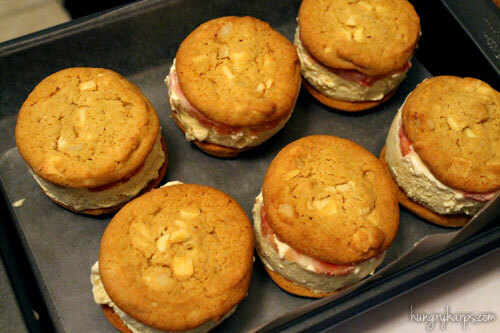 I really liked the sound of Tropical Ice Cream Sandwiches made with Macadamia Nut Cookies, vanilla ice cream and real fruit – but I really didn’t like the idea of cutting up a bunch of fruit every time I made a batch of these bad boys. I am not trying to sound lazy – it’s just that with 4 kids I tend to find myself a little rushed, pressed for time, busy, frazzled… you get the idea. 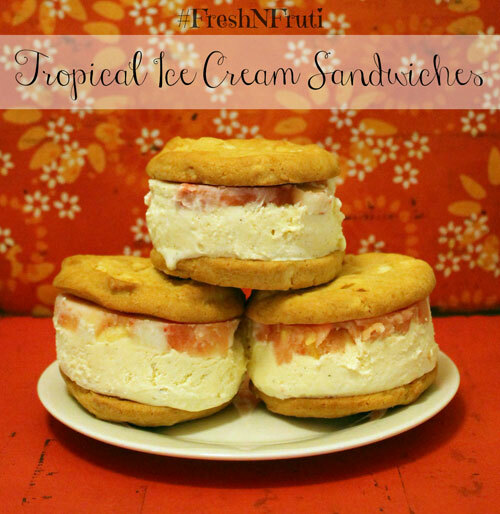 But I couldn’t shake the idea of these Tropical Ice Cream Sandwiches – they sounded right up my alley. 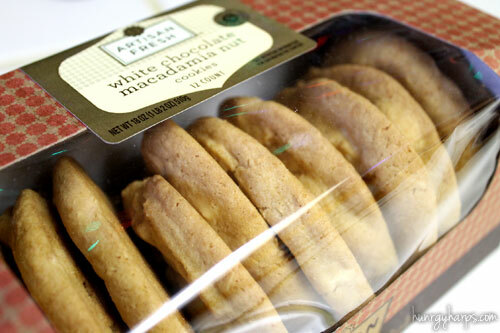 Especially with using White Chocolate Macadamia Nut Cookies, my all time favorite cookie. I thought about using frozen fruit, but it gets too soggy when it’s thawed and it’s too hard to cut through when frozen. And then it hit me like a ton of bricks – use frozen fruit bars!! Not the sugar filled ones though, I am talking 100% natural here, since it would be substituted for fresh fruit. Plus, I would be able to cut through them since they are soft enough to bite into. I was so excited to give it a try!! I chose to use Chunks O’ Fruti 100% Natural Fruit Bars – have you heard of them before? 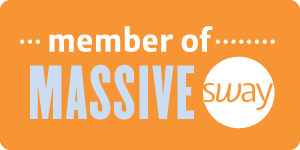 If not, let me tell you – they are amazing!! The Chunks O' Fruti bars contain real fruit that is either freshly frozen or freshly packed after harvesting. Not only is real, premium fruit used – it’s also the first ingredient in each of the bars! No high fructose corn syrup in these beauties, just like how they would be if homemade. Are you starting to see why I am in love yet? 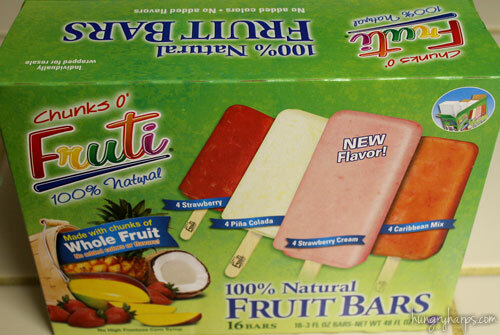 To top it off, Chunks O' Fruti Fruit Bars are 100% natural and their non-cream bars are verified by the Non-GMO Project. What an awesome product!! I bought my box of Chunks O’ Fruti bars at my local Sam’s Club. (I posted pictures from my shopping trip HERE on Google+) You know the awesome ladies & gentlemen, at Sam’s Club, that do demos of food for customers to sample? I found out that they will be doing a demo on Chunks O’ Fruti bars on May 13th – check it out if you haven’t tried the bars yet! The variety box came with 4 of each flavor: strawberry, pina colada, strawberry cream and caribbean mix. I love the fun packaging! Let me give you a quick run down of how I made these Tropical Ice Cream Sandwiches - for a full recipe, see the bottom of post. 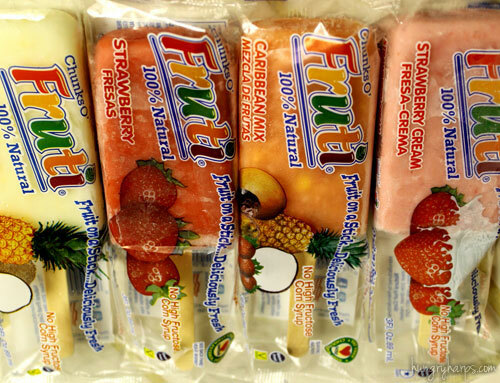 First, we need any 5 Chunks O' Fruti Fruit Bars. I chose one of each flavor, except for caribbean mix which I used two of. Each of these bars needs to be cut into chunks. They cut very nicely and stay intact. I was a little worried about them splitting on crumbling - but they were easy to cut and retained their shape. Spread the pieces in a 9x13 baking dish. Cover with softened vanilla ice cream. Spread smooth. 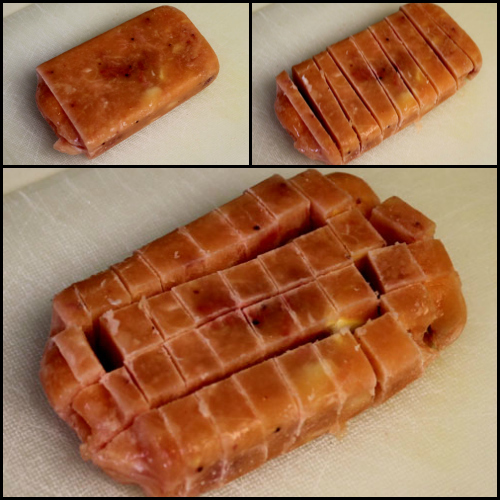 Place in freezer for 45 minutes or longer. Line another pan with wax paper and lay 6 cookies face down on top. Get the Fruti & ice cream mix from the freezer. Cut out circles of mix using a pint glass to measure the size and a butter knife to cut. 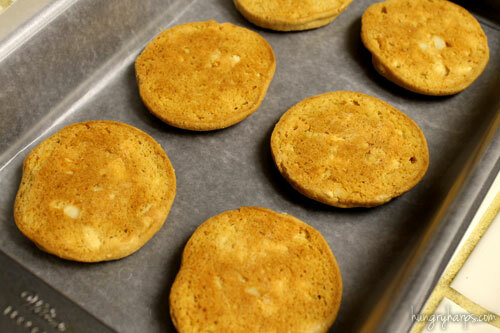 Place circles on top of cookies. Let the ice cream melt a little so that when the sandwiches get frozen again all the pieces will stick together. And then devour with your friends and family! :) These were a blast to make and I am too excited to make more this summer for our cookouts. These were a test run for later this season and let me tell you, they were awesome! 1. 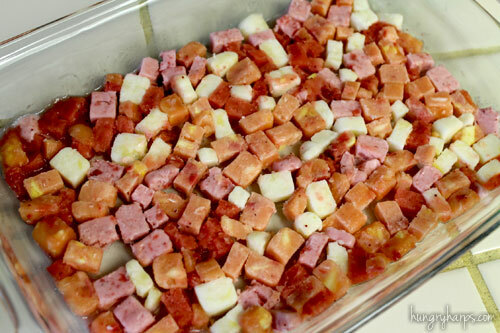 Chop each Chunks O’ Fruti bar into small chunks. 3. 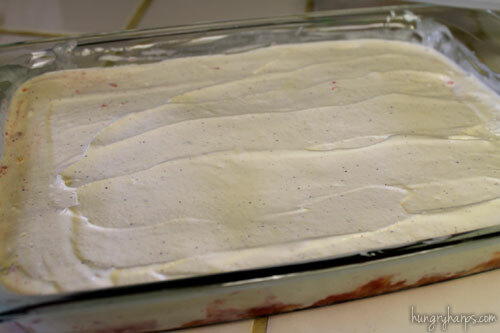 Top with softened ice cream. Place in freezer for minimum of 45 minutes. 4. In a new baking dish, line with wax paper and place inside 6 cookies, face down. 5. 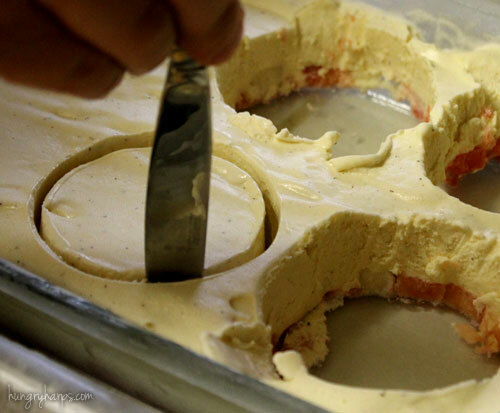 Using a pint glass, or some other circular object that is similar to size of cookies you are using - press into top of ice cream to measure size you want to cut. Then cut each circle using a butter knife. 6. 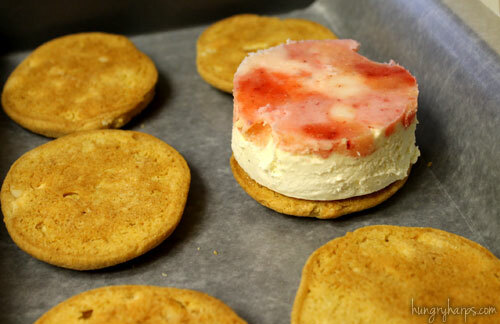 Place ice cream circles onto cookies that are in baking dish. Top with remaining 6 cookies. 7. 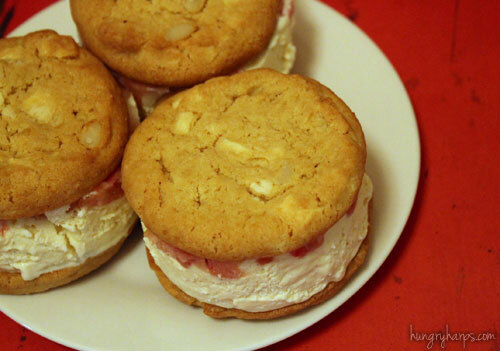 Let melt for about 7 minutes, so that cookies and ice cream will adhere to each other. 8. 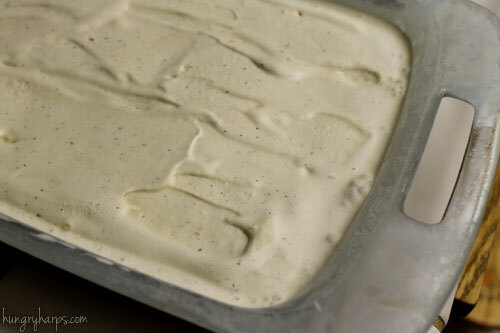 Freeze for a couple hours or until ice cream is firm again.